The Gola League had been renamed The GM Vauxhall Conference and it was announced by the powers that be that the eventual champions would, for the first time, be automatically promoted to the Football League. Obviously expectations were high at every club and most had dug deep financially to bolster their squads. 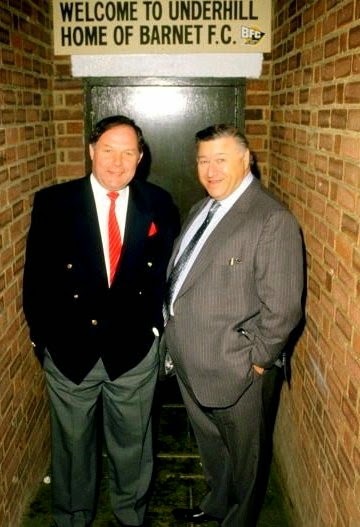 18 months earlier in the New Year of 1985, Bees manager Barry Fry had dramatically taken the managers’ role at Maidstone United. “They are the Manchester United of the non league” he declared! However Barnet’s new Chairman Stanley Flashman had decided “Barry is still the man for this club” and after two relatively poor seasons seeing the Bees finish 15th and 14th reinstated him for the start of this season with the promise of a financially secure future. 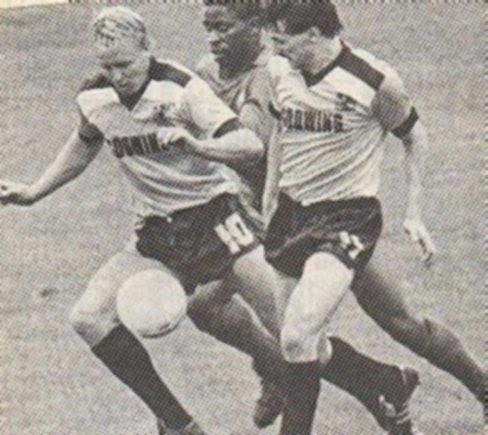 The season was to become the catalyst for Barnet’s assault on the championship, which had so many highs and lows leading to the ultimate goal of promotion in May of 1991. For starters Barnet were to battle tooth and nail with Neil Warnock’s Seadogs of Scarborough. To set the scene, 1986 had its fair share of incident with the loss of the US Space Shuttle Challenger and the Chernobyl nuclear disaster. Top Gun and Crocodile Dundee were back row viewing at the cinema. In the football world Argentina had won the World Cup in Mexico with a little help from God’s hand (but Nicky was in Bedford all the time when not on holiday I hear you say) and Liverpool had completed the league and cup double. We were all singing along to Sledge Hammer by Peter Gabriel, Lady In Red by Chris De Burgh, and Snooker Loopy by Chas’n’Dave. It had been 10 years since any silverware of note had been found in the club boardroom and the early 1980’s had been very low key apart from the defeats in two League Cup finals one to Scarborough in 1983/4 and the other to Stafford Rangers in 1985/6. Yet Barry now had at his disposal a very imposing squad of players. The goalkeeping duties for most of the season were to fall to the charismatic Steve Humphries but he had a rival at the start of the season in Kevin Blackwell. By Christmas Kevin had moved on, yes you guessed it, Scarborough. Club Captain Kevin Millett and Glyn Creaser was the strong central defence partnership with Peter Brown, ex England fullback and first team coach Steve Whitworth and Steve Cox providing the back up. Andy Beattie, signed later in the season, was to add even more power and experience. Edwin Stein, John Margerrison, Robert Codner and Barry Little were the mainstay of the midfield and with a choice of Nicky Evans, summer signing Keith Alexander, David Sansom and Steve Mahoney to provide the goals. The future looked very rosy indeed. An opening day 3-0 win at Kidderminster Harriers with goals from Margerrison (2) and Evans set the club on their way to gaining 10 points from a possible 12 from their first four games. Especially sweet for Fry was the 3-1 victory at Underhill over his previous club Maidstone Utd in front of a bumper 2,140 crowd, the best in the league for some two and half years. A slip up at home to Sutton Utd at the end of August was more than made up for with a brilliant attacking performance at Boston Utd’s York Street ground with Evans scoring two in a 3-0 win. A 4-1 mauling of Nuneaton Borough should have been the basis for a strong FA Cup run but lowly Dulwich Hamlet came to Underhill in mid September for a 1st Qualifying round tie and ran out comfortable 2-0 winners. On the eve of this game the club had signed a new three-year sponsorship deal with local businessman Dave Godwin for a staggering £40,000. The team responded to the FA Cup disaster with two 5-1 victories, the first at Gateshead and the other another emphatic performance against Boston Utd. Barnet were now sitting proud at the top of the table, the first time they had occupied such a position since the Alliance was formed in 1979. Scarborough came to Underhill in mid October and goals from Stein and Evans gave the Bees a share of the points. The clubs had fought out another draw, a dogged 0-0 at Scarborough in late September. When November came Barnet had slipped into third spot behind Maidstone and Altrincham but after wins over Frickley Athletic, Runcorn and Dagenham the Bees were back on top. The Bees secured a league double over Kidderminster, but a string of good results during the run up to saw Scarborough regain pole position in the table with the Bees second and Enfield third. 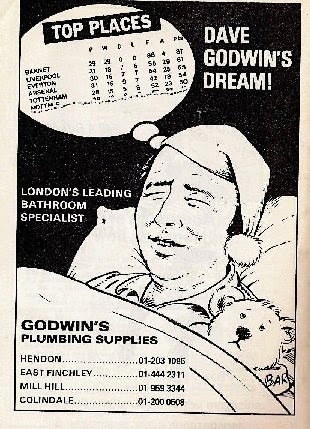 The Christmas and New Year period was to be most exciting of times as Enfield were to be the opposition twice. 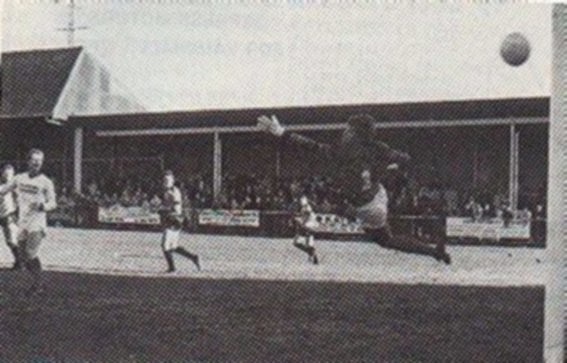 A Steve Cox rocket from 25 yards separated the teams at Underhill on Boxing Day morning in front of over 4,000 fans. Oh to re-live that moment on packed West Bank terrace. "Steve Cox - Andy Pape NO CHANCE"
For the return at Southbury Road on New Years Day goals from Alexander, Margerrison and Mahoney secured a 3-0 win in front of over 2,000 fans. It was the E’s biggest league attendance in a decade including some 1,000 Bees followers. An interesting note is that six of the Enfield team facing us that day were to pull on an amber and black shirt during their careers. The team saved some Christmas leftovers for the visit of Northwich Victoria two days later as four second half goals hit the back of the Underhill net. The game was marred however by a serious injury to Glyn Creaser and Barry Fry captured Andy Beattie from Cambridge Utd as cover. Barnet went back to the top of the table in early February courtesy of two Nicky Evans goals in the comfortable 3-1 at Nuneaton Borough while Scarborough dropped valuable points in their clash with high flying Maidstone Utd. A bid from a mystery First Division club of £25,000 for goalkeeper Steve Humphries was rejected by Flashman as ‘absurd’ and at this stage the Bees had two games in hand on their rivals and the dream of league football was becoming believable. The 1986 FA Trophy run for the club had in the first two rounds been a bit of a stroll. A 6-0 trashing of Wokingham Town came first followed by a 5-0 victory at Hitchin Town albeit after a 1-1 at Underhill. However the drama that was to unfold in three 3rd round games against Boston United was wonderful and I was privileged to be present at one of the finest Barnet performances in their history. A Sansom goal at Underhill levelled the scores at 1-1 and forced a replay at York Street. A cold February night witnessed a magnificent extra time 3-3 game with Andy Beattie (2) and Sansom again, our scorers. The second replay played at The Abbey Stadium Cambridge was the most one-sided game you could wish to see. We hit the bar and both posts during the first half but It became David Sansoms’ finest hour (or 45 minutes) in the second half and he scored two goals in the 3-0 win. Eddie Stein scored the other and his celebration was a joy to behold. The bubble then burst as Fareham Town from the Southern Premier League came a-calling in the 4th round and nicked a 1-0 win in front of nearly 2,000 spectators. We hit the post at least three times and had numerous near misses during the game but it was not to be. Ironically it was after that magnificent display at Cambridge that things began to go wrong. During March Barnet secured only five league points from a possible 12 while Scarborough had three wins on the trot and by the end of the month they were four points clear. This made the home game versus Kettering Town on the first Saturday in April absolutely vital. A frankly poor performance against a frankly average side resulted in a 2-1 defeat and time was running out. Two great away victories at Stafford Rangers and Bath City were cancelled out by two victories by Scarborough and approaching the last four games they were now six points clear. Easter time has always traditionally sorted out the men from the boys. Cox, Evans and Sansom goals finally broke down a stubborn Gateshead defence but there was no such luck to be had at the old foes Wealdstone on Easter Monday and the Bees had to settle for a 0-0 draw. The race was finally over as the Bees were avenged by Stafford Rangers at Underhill loosing 2-1 leaving our Yorkshire rivals six points clear with just one game remaining. The results on the last day of the season were irrelevant but for the record Scarborough beat Weymouth at home 2-1 while a Barry Little goal helped the Bees to a 1-0 win at Underhill over Dagenham. Scarborough’s brilliant run in, winning 10 and drawing one of their last 12 games and Barnet’s erratic home performances clinched it. The Seadogs also won 15 games on the road while conceding just 14 goals. The fact is the 85 points won by Barnet in an average season would probably have been enough to lift the title. On a brighter note attendances at Underhill that season were over twice the average of the previous season, (just under 2,000 and the best in the Conference) and they were to increase steadily over the next four seasons. Barry Frys’ insistence on a three man forward line, attacking flair and cavalier attitude was a joy to behold and attracted accolades galore. For the first time in many years three players grabbed over 20 goals, Evans, Mahoney, and Sansom. 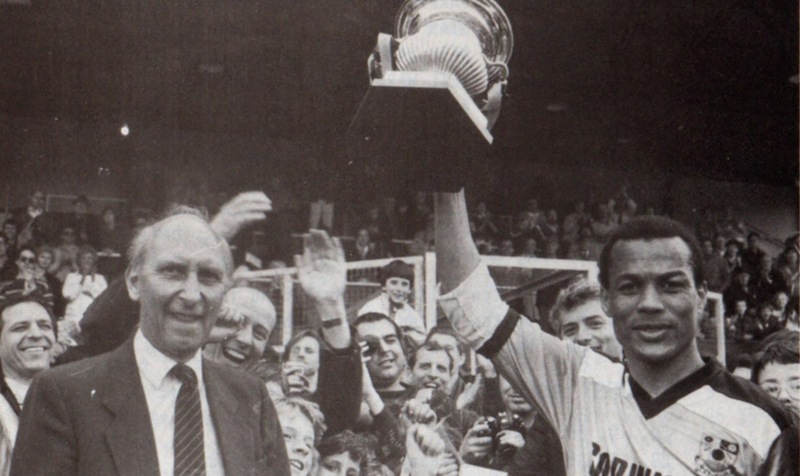 Season 1986/7 was the season that finally re-launched Barnet Football Club as a major force in non-league football again. Hello trying to find the result of a friendly match with Spurs on 12 August 1986. My friend is a Barnet supporter and I've bought him a programme for that day. Can you help. Thank you. The game finished 2-2 with Gary Roberts and Keith Alexander the Bees scorers, attendance recorded as only 1,121 - yeah alright there wee that many Spurs fans in the ground on the day!!! !- Although one must remember that Mr Flashman registered all gate receipts with the IR.